EDITORS' NOTE: CWB Chicago is sponsoring a certified charity GoFundMe campaign to raise money for the Chicago Police Memorial Foundation's K9's For Cops program. We're just $700 shy of our goal, so now's the time to push the campaign to the finish line! The Foundation supports the families of Chicago police officers who are killed or seriously injured in the line of duty. Today, we continue our profiles of 19th District (Town Hall) police officers who have been killed in the line of duty while serving the people of our neighborhood. 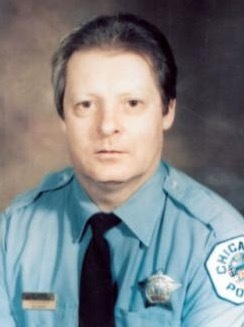 On April 3, 1986, Richard Clark was a 48-year-old, 18-year veteran of the Chicago Police Department, assigned to the 19th District Tactical Unit. At about 3 p.m., Clark responded to a call about a “man with a gun” in the 1400 block of West Lill Avenue. Earlier in the day, John Pasch, Jr., had murdered his 45-year old landlord, when she tried to evict him for non-payment of rent. Pasch, armed with a rifle, fled to a nearby home and found a 74-year-old woman inside. Unbeknownst Clark and other arriving officers, Pasch was waiting for their arrival with a rifle pointed at the street. Officer Clark was fatally shot after stepping out of his squad car. Pasch was arrested after a 36-hour standoff. Clark was survived by his wife and two children. Learn about other 19th District officer who gave their lives in the line of duty HERE.